Silver Chunky Filigree Expanding Bangle. Beautifully presented in a Kooqi gift box and red organza bag. 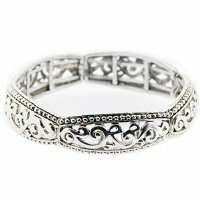 Title: Silver Chunky Filigree Expanding Bangle. Beautifully presented in a Kooqi gift box and red organza bag. Sterling Silver Star With Cubic Zirconia Toe Ring. Beautifully presented in a Kooqi gift box and red organza bag. Kooqi 925 Sterling Silver Ladybug and Crystal Flower Toe Ring. Beautifully presented in a Kooqi gift box and red organza bag. Genuine Biagi 925 Sterling Silver Charm Bead in Dark Blue and White Spirals. Beautifully presented in a Kooqi gift box and red organza bag. The Wave 925 Sterling Silver Toe Ring. Beautifully presented in a Kooqi gift box and red organza bag. Mens Jewellery - Mens 316L Stainless Steel Ring With Engraved Greek Key Pattern. Presented in a contemporary Kooqi black and silver gift tin. High Polish Chunky 925 Sterling Silver Toe Ring with a Love Heart. Beautifully presented in a Kooqi gift box and red organza bag. Sterling Silver Solitaire Twist Toe Ring. Beautifully presented in a Kooqi gift box and red organza bag. Citrine and White Topaz Sterling Silver Pendant Necklace. Beautifully presented in a Kooqi gift box and red organza bag. Venetian Murano Glass Rainbow and Gold Round Earring Studs. Genuine handmade in Italy, beautifully presented in a gift box with certificate of authenticity. Sterling Silver Cubic Zirconia Wishbone Toe Ring. Beautifully presented in a Kooqi gift box and red organza bag. Venetian Murano Glass Scarlet and Gold Drop Earrings. Beautifully presented in a murano gift box with genuine Venetian glass certificate. Venetian Murano Glass Green and Lemon Chubby Heart Pendant Necklace. Genuine handmade in Italy, beautifully presented in a gift box with certificate of authenticity. GmcKenzie Genuine Turquoise and Sterling Silver Flower Pendant Necklace. Beautifully presented in a Kooqi gift box and red organza bag. Faith Hope Love and Luck Four Leaf Clover 925 Sterling Silver Pendant Necklace. Beautifully presented in a Kooqi gift box and red organza bag. Venetian Murano Glass Emerald Green and Gold Open Circle Pendant and Earrings Jewellery Set. Genuine handmade in Italy, beautifully presented in a gift box with certificate of authenticity. Venetian Murano Glass Blue and Gold Marbling Round Drop Earrings. Genuine handmade in Italy, beautifully presented in a gift box with certificate of authenticity.